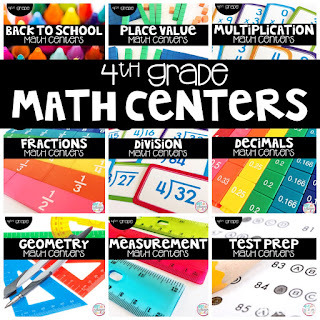 The most asked question I get from teachers using my math centers is, "How do you store and organize the centers?" Plus, I made some FREE labels for you! There are two things that I have to organize when it comes to my math center materials. First, I have to have a place to store the sets of centers that my students are not currently using. Then I need a way to store the ten centers that my students are working on. I have a total of nine different center units. Students will only need access to one unit at a time. Therefore, I need a way to store those units that are not in use. Students don't need to access these boxes. 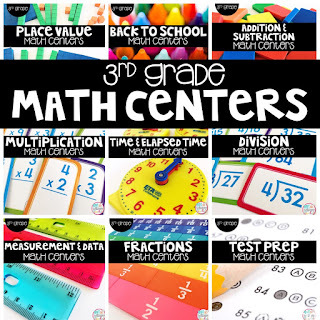 They are just for the teacher to keep center materials organized. My very favorite way to store center units is in these plastic containers. I purchased mine from Target, but you can also get similar ones HERE from Amazon. The size is perfect for storing all ten centers from a unit along with the master copy for the recording book. Another option for storing the centers that you are not using are these letter sized plastic envelopes. The envelopes have a slider to keep them closed and are more durable than a Ziploc bag. I like that these envelopes are very slim and do not take up much space at all. They can be put in a filing cabinet, a file box or a crate. You can buy the envelopes HERE. Plastic drawers are perfect for storing centers that are not currently being used. Each set has three drawers, so you would need three sets to fit all nine center units. I got the small drawers and they don't take up much space at all! They are only about 6 1/2 inches wide. You can buy the drawers HERE or at Walmart. My centers units each have ten different centers. During their independent center rotation, students work on these activities. I allow them to complete the centers in any order that they wish. Since there are ten centers, and only a small group working on them, there is always a center to choose. You just have to have some way to store them that is easy for students to access. The same plastic boxes that I used to organize centers that are not in use, can be used for the centers that students are currently working on. Instead of labeling them with the skill, I just label the boxes with a number from 1-10. When it is time to change the centers out, I will put these back in their skill box and put a new set in the numbered boxes. 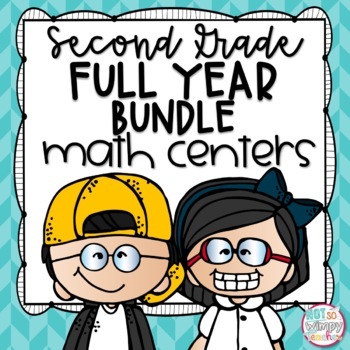 It's so easy, that a student helper can do it for you! Again, I got my boxes at Target. Some people have had trouble finding them there. They can also be found HERE on Amazon. Pencil pouches are the perfect size for a set of math centers and the manipulatives needed for the center! They are durable and have a zipper closure. Pencil pouches are very inexpensive. I found them at Walmart for around $1. You will need ten of them since there are ten different centers in a set. I like to put my ten pencil pouches in a mini crate. I got the crate at Walmart in the office supply aisle for $1. It doesn't take up much space at all. It is just big enough for the pouches. If you have a white board, you could use a magnetic container for the envelopes! I found mine at the container store, but I have seen magnetic pouches at Laskshore. I found THIS one on Amazon and I think it would work perfectly! The small plastic envelopes are perfect for the ten centers that students are currently working on! They are business envelope size. The envelopes are more sturdy and easier too close than Ziploc bags. They will last longer. They are nice and thin and can be stored in a small crate or plastic container for students to access. The magnetic container would also be perfect and a great way to save space! I got my small plastic envelopes from the container store, but you can get similar ones (that are less expensive) from Amazon. Click HERE to check them out. 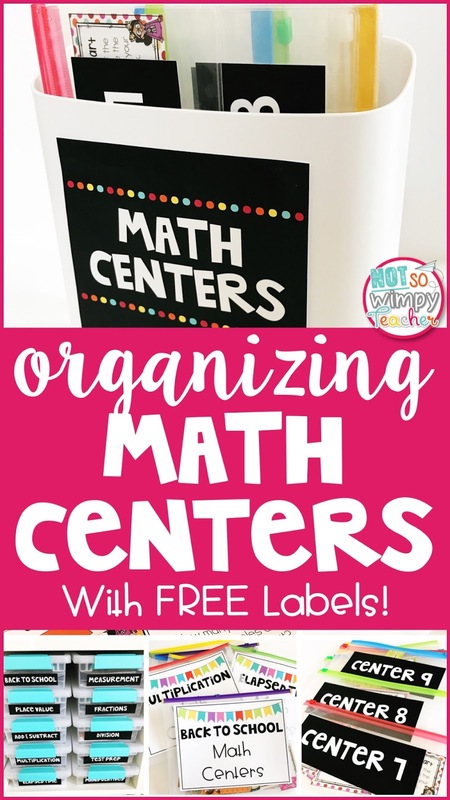 I hope that these organizational ideas will help you to implement math centers and keep them organized in your classroom! Would you like some FREE labels to use on your new beautiful containers?! Click HERE to grab a collection of labels that will work for all of the different organizational ideas that I mentioned above. 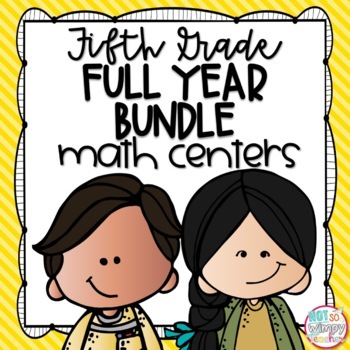 If you are looking for math center resources, I have bundles for third and for fourth grades. The bundles includes nine different skill units. Each unit has ten different centers. You are getting 90 centers! Click on the pictures below to check them out!